Piles of trash are an ongoing problem on this strip of 61st Street between 8th and 15th Avenues. (Justin Mitchell/Bklyner). 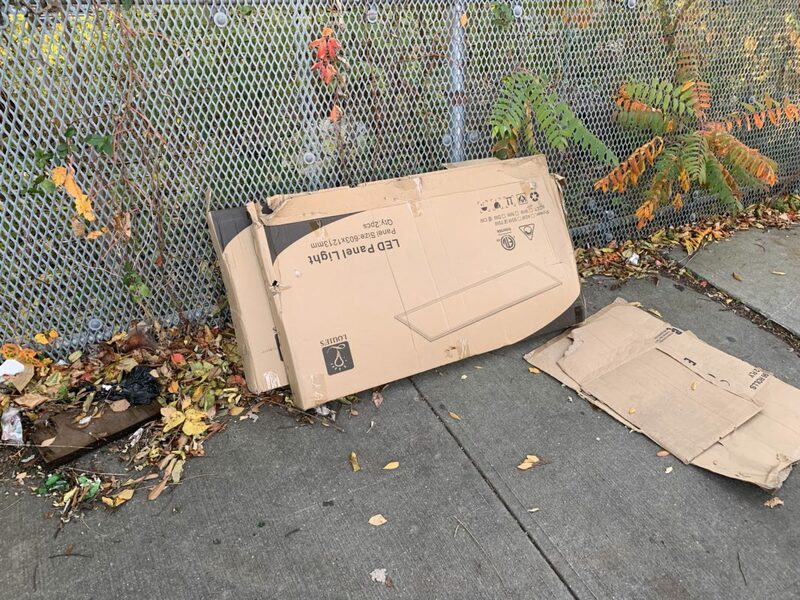 BOROUGH PARK / SUNSET PARK – Food containers, industrial lights, protective diapers, tiles—one stretch of the sidewalk next to the tracks carrying the N-train through southwest Brooklyn is an ongoing eyesore for residents and business owners. This strip of 61st Street between 8th and 15th Avenues, along the southern border of Borough Park and extending slightly into Sunset Park, with Dyker Heights and Bensonhurst to the south, has become notorious for random piles of garbage, from litter to electronics, industrial and construction waste. Many in the neighborhood are fed up. “You’ll see them throwing mattresses and freaking TV’s and all kinds of crap,” said Richard Ortiz, who has lived on 61st street near 10th Avenue for ten years. Ortiz said he has seen trucks pull up in the middle of the night and early in the morning. “I told the sanitation all the time, you got to have someone here at two or three o’clock in the morning, when they dump it. They never listen,” he said. Some of the garbage along 61st Street appears to come from businesses. (Justin Mitchell/Bklyner). Several residents and business owners point towards a small encampment of homeless people living at 61st Street and 10th Avenue. Antonio, one of the people staying at the homeless encampment, denied the homeless, whom he said are all from Mexico, are responsible for the trash. He added that sanitation officials spoke to them Saturday and told them not to dump along 61st Street, and they have obeyed those orders. “We’re homeless, but we respect everybody,” he said. 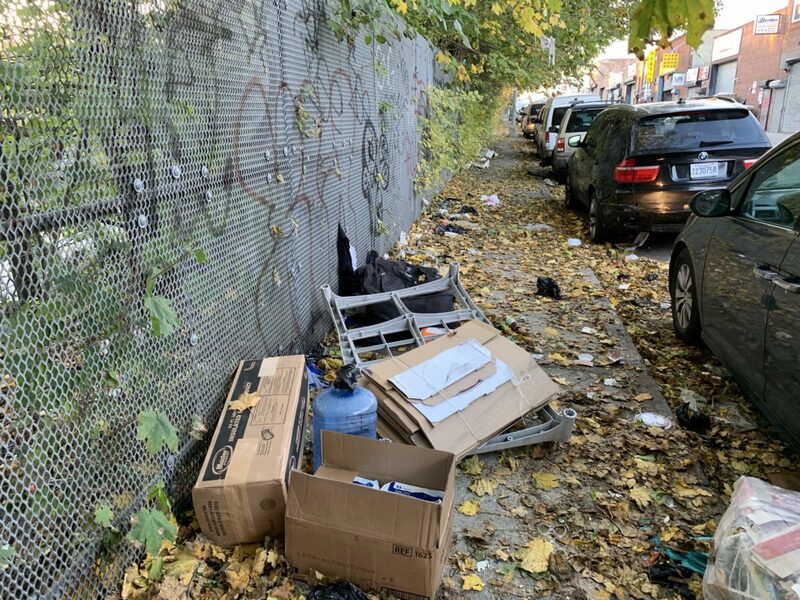 On Sunday, Bklyner observed trash stretching along the entire length of the strip, concentrated most heavily between 8th and 9th Avenues, a block away from the encampment, and between 13th and 14th Avenues, several blocks away. There was a wide variety of waste, from air conditioners to baby carriages to an entire box of unused protective diapers. 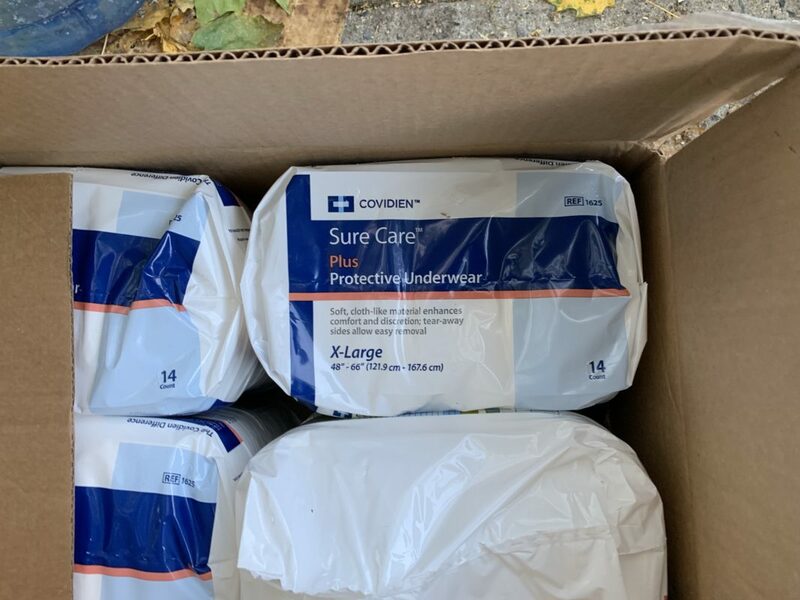 An apparently unused box of protective underwear were among the trash along 61st Street Sunday. (Justin Mitchell/Bklyner). Ortiz said he suspects nearby businesses, as well as residents, are dumping trash along the strip, saying he has seen refuse he strongly believes come from nearby businesses. Wai also said that was a factor, but said he thinks it is mostly businesses from a ways away. “You have to realize that here are some businesses that are like small contractors that don’t want to pay to throw out garbage, so they got to sometimes throw stuff along these few blocks, I think,” Wai said. Wai added that his business’s security cameras have captured cargo trucks driving up and dumping trash late at night. Ortiz and several of his neighbors agreed the city should put up cameras along the strip to monitor who is dumping trash. “I think maybe a good idea would be putting a camera over there so they all could see who dumps their garbage over there and maybe have people clean it up,” said Amy, a woman who answered the door in a house on 61st between 8th and 9th Avenues. The Department of Sanitation said it would dispatch a cleaning crew to the area, but that ultimate responsibility for maintaining the area falls on the Metropolitan Transportation Authority. They encouraged residents to report illegal dumping to 311 or here. When asked for comment, the MTA passed Bklyner’s request to the Long Island Rail Road, which is responsible for the track directly behind the fence. “We want to be good neighbors, we are investigating,” LIRR spokesman Aaron Donovan said in an email. The MTA oversees the LIRR. 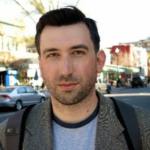 Bklyner has also requested comment from Brooklyn Community Board 12 and the office of City Councilman Kalman Yeger, but they have chosen not to respond. I went on a walk here a few months ago and it was really kind of fascinating. I am sure its horrible for the people who live here, but its kind of like the Dead Horse Bay of Central Brooklyn. This is also a problem on 37th st between 5th ave and fort Hamilton in Sunset Park. Tvs, broken plate glass, a couch. All dumped. We have called 311 tons of times and it never gets cleaned up.